People ask me all the time “Emma, what do you do when the baseball season is over?” or “What do you now that the Dodgers are not playing?” I tell them there is still baseball being played in the Fall League and there are baseball related events going on. For example I went to SABR (Society for American Baseball Research) meeting on Saturday October 1st. We had Wes Parker as our speaker. Afterwards a new president was elected and at the end we had a baseball books auction. You see Greg is a Giant fan. He was sporting a Seals jersey at his exhibition. What he doesn’t know is that God IS a Dodger fan. Tommy always talks about the BIG Dodger in the sky. 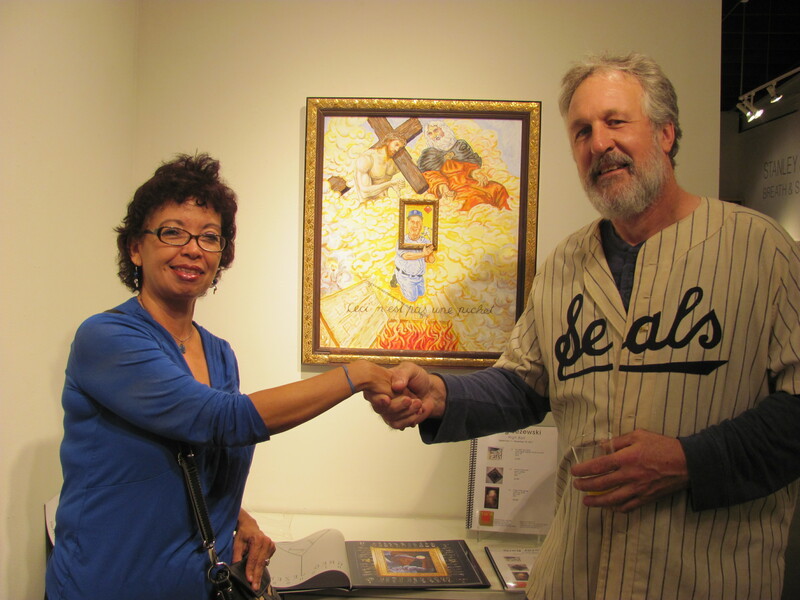 But despise Greg being a Giant fan, he has a nice baseball-themed kinetic sculptures and multi-media paintings at the exhibition in Santa Monica at Frank Pictures Gallery at Bergamot Station, 2525 Michigan Ave., Santa Monica. Here is the link to the gallery website and photos of the work in display http://frankpicturesgallery.com/artists/GregJ/gregj.html Check it out, is on display until November 10th. I had a wonderful time there looking at the exhibition and talking to Greg and Terry & Mary Cannon. Terry is the Executive Director of the Baseball Reliquary. I had so much fun talking to Terry & Mary. Jeff, Just like you guys with the Cubs! lol. Good luck! Rooting for you and Allen to duke it out in the WS. Emma, you do keep the baseball fires burning with all your activities in the off-season. Very admirable! And I love to keep the fires burning! lol. I love that I can find baseball related events during the MLB offseason. Might be going to Arizona for a few Fall league games there. Emma: God is a Dodger fan? Haha niceeee. That’s a beautiful piece! Looks like the offseason is going well so far. Awwww, I was out of town or I definitely would have gone. I’ll have to check out their site for the next event. Another event that sounds like fun but I will probably miss, the Lake Elsinore Storm have a haunted house at their stadium this month. I know each of us think that God is fan of “OUR” teams. Let’s just say that he is a Baseball fan and he has the best team made of of all our best departed players. the exhibition is on till November 10th. If you happen to be in Santa Monica, check it out. I hink next time thee is something close by baseball related, I will let you know ahead of time. You should check out the Baseball Reliquary events. October 27, 2011 - 10:24 am Rants, Raves, etc. You got it! Greg’s humor. Yeah, those are some unique artwork by Greg.